How do I check my Junk folder email folder in Outlook? One fairly common issue that users encounter is not receiving emails from Sadlier Connect™. The vast majority of time when this occurs the email message has gotten flagged as junk/spam by the customers mail server. So if you were expecting information from Sadlier Connect™ and have not received it, you should first check your junk/spam folder. Requesting us to resend the information without clearing this potential issue will most likely result in the subsequent emails getting caught in junk/spam folder. 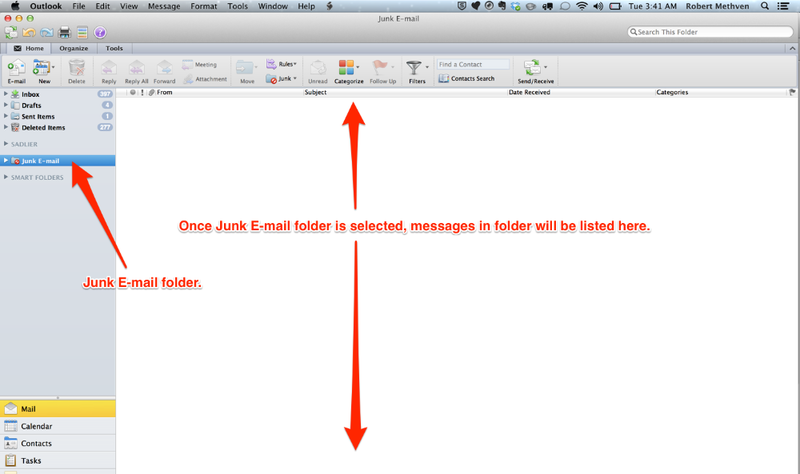 The screenshot below should help you find your Junk E-mail folder if you are not sure where it is in Outlook. The specific location and folders around the Junk E-mail folder may vary. You will want to search for emails from support@sadlierconnect.com. If you find an email from Sadlier Connect™ you will want to open the message and then mark the email as not being Junk. You may need to contact your school's network or system administrator to white list sadlierconnect.com so that future emails do not get flagged in your Junk E-mail folder. If you are not using Outlook your email client should have something similar to spam, possible referred to as Junk or Spam.